College of Engineering Seoul Natl. Univ. 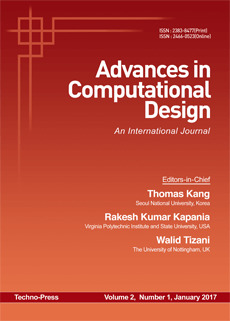 • Computer-Aided Design in Engineering, • Computer Graphics and Modeling, • Computational Design Issues in Structural, Architectural, Electronic, Mechanical Systems, etc., • Computer-Aided Manufacturing and Management, • Analytical and Numerical Modeling of Structures, Systems and Elements, • Optimizations with Computational Analysis, • Manufacturing Engineering with Computers, • Human, Bio and Medical Applications, • Industrial Design and Arts with CAD, • Design Using BIM, • Multidisciplinary Design Optimization, • Reliability Based Design. Dr. B.R. Ambedkar National Instt. of Tech. School of Civ., Envir. and Mining Eng. IFRT, Karlsruhe Inst. of Technol.